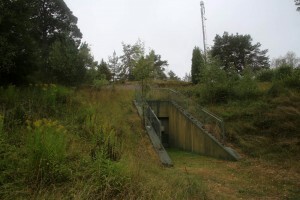 Blasttrap (stötvågsssluss) area in the newer entrance from 1987. Main entrance from 1987, photo from 2014. The upper entrance to the site in 2006. This one was made during the reconstruction of the site in 1987. The original is still used as emergency exit from the lower floor. Entrance tunnel down towards the primary blast door. Decontamination room - on the lower floor. Only a simple water tap and an alarm bell. This is the old entrance, on the upper floor there is a more modern one. The lower exit is behind the red door, far back. 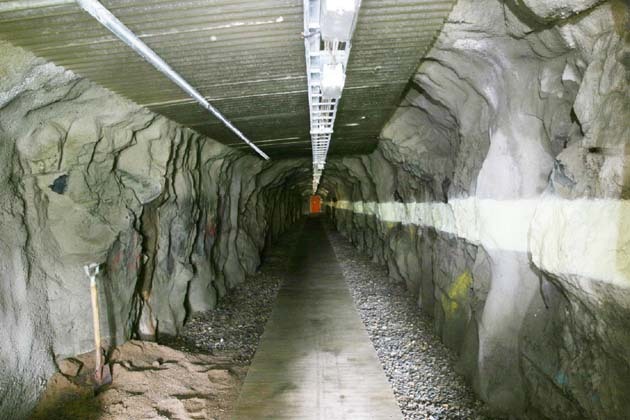 The half wall to the right is installed in 1987 when the site was upgraded to EMP protection. The engine room on the lower level, close to the lower exit. A six-cylinder Volvo capable of generating 55kW. Male washing and toilet facilities. Dining room - with the kitchen to the right. There should be tables to the left. Capable of handling at least 60 persons. Kitchen on the lower floor. Telephone central - information came in on separate channels from different organisations, for instance fire department. The information was then brought in to the main room on the other side of the door far back. Incoming communication room. Fully EMP protected case round the room and wooden floor to protect from electro static discharge. Generator control panel - the control panel on the upper level to be able to view the current load on the generator. As can be seen the generator was running at this visit.